Web Marketing in Massachusetts That Gets Results! At GetReady Web Marketing our goal is to make sure you have a website that is effective at getting you new customers online. We accomplish this with our Custom Web Designs, Search Engine Optimization, Google AdWords and Social Media services. Our custom web designs will differentiate your business from your competitors, generate leads with a call to action and contact form on every page and are search engine friendly. Our search engine optimization service will get your website on the first page of the search results when people search online for the services your business provides. 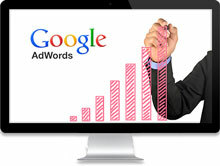 Pay-per-click services like Google AdWords will give your business visibility quickly. A Social Medial presence on Facebook, Twitter, LinkedIn and Google Plus will allow you to connect with your customers and acquire new ones. When someone finds your website online we’ll make sure your website looks credible and is effective at converting visitors into leads. Our website redesign services will make sure your business has a search engine friendly and effective website. In a nutshell, Search Engine Optimization aka “SEO” is the process of optimizing a website so that the search engines (Google, Yahoo, Bing, etc.) will better understand what your website is all about. This in turn will improve the search engine rankings for your website when people search online for your services. Getting your website on the 1st page of Google is one of the most cost effective things you can do to generate a steady stream of leads for your business. Learn more about our SEO services. Pay-Per-Click (PPC) is another method for getting a website on the first page of the search results. Unlike organic SEO, you pay each time someone clicks on your website in the search results. The most popular PPC service is Google AdWords because it will get your website to display on the first page of Google when someone searches using the keywords related to your business. PPC generally costs more in the long run, but the results come quicker so if you need to get your website on the 1st page of the search results right away PPC may be an option you will want to explore further. Learn more about our PPC services. Learn more about our website redesign services. Social Media is great tool for your business to use to connect with existing customers and gain new customers. A Facebook business page along with Facebook advertising is an inexpensive way for a local business to be visible to thousands of potential customers in a local area. Additionally, Facebook, Twitter and Google+ are rankings factors in Google. Having a good social media presence is essential for any business. Learn more about our social media marketing services. Clients have complemented us on the site and we’re extremely pleased with the clean look and functionality of the site. It was also a true pleasure dealing with Rick, who is a consummate professional—highly knowledgeable, very responsive and actively interested in promoting his clients’ businesses with invaluable traffic-generating strategies. Not only will we be using them to assist us with tweaking the site as our law practice grows, we will also refer clients and colleagues.